General Discussion : First kestrels today! I put up a kestrel box in March 2017 but had no visitors all last year. The box is in the least used quadrant next to the house on the SE side overlooking the 17th hole of a golf course. I was discouraged; but today I saw a male kestrel perched on the bird feeder in the back yard and have observed kestrels entering and leaving the nest box throughout the day. So March 5, 2017 is a day we will remember. Last year, for the first time since 2010, I did not have kestrels in the nestbox due to the fact that the male broke his neck on a neighbor's glass deck railing in mid January. The female stopped overnight roosting in March of 2017 to find another mate, I suspect. Early this year, I had kestrels during the day and screech owls at night. 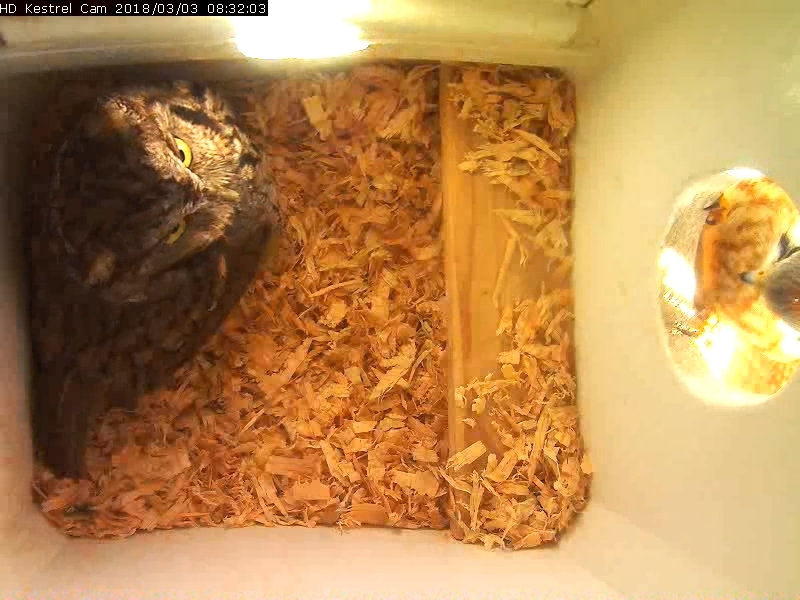 It looks like the screech owls won, because yesterday the female screech owl deposited her first egg and has had several Mexican standoffs with the female kestrel in the past few days. Wow!!!!! That is an awesome tennant, but I guess the female kestrel will have to find another home for this nesting season, alas. Can you make another box, lickety split? I definitely don't have time to crank out another nestbox this nesting season due to home projects and a vacation in the works, but I think that the two species might be able to coexist in the same general area since they are active at different times. I'll put a second box on my "to-do" list. 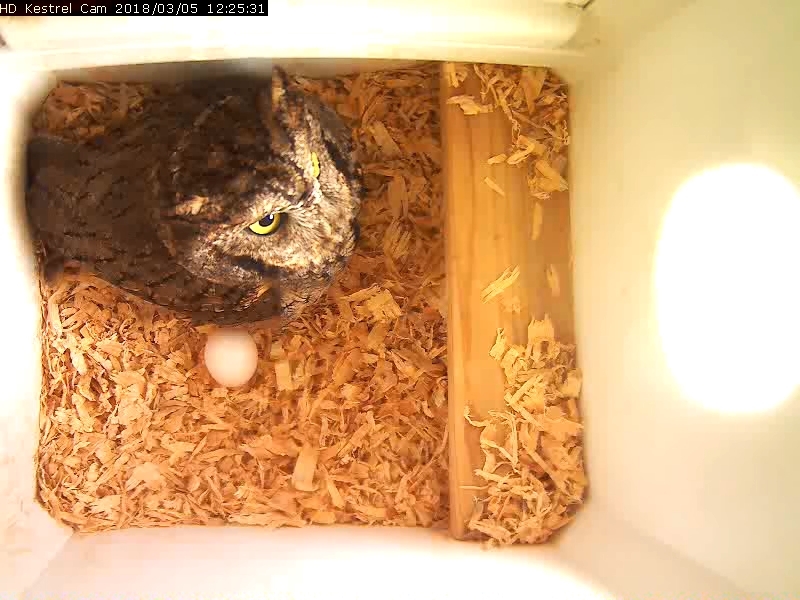 Western Screech Owl egg #2 was banked about midnight on the night of March 7-8. 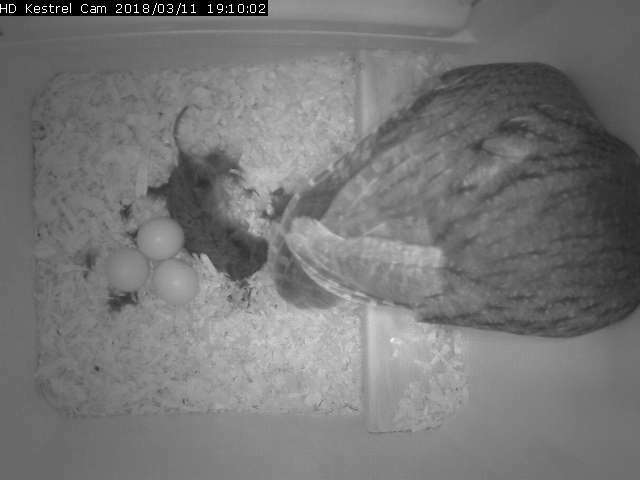 It will be interesting to see how the owls space their egg laying. After 5 years of nestbox camera observations of American Kestrels, the egg spacing was always like clockwork, every 2 days ± a few hours; 5 eggs with exactly 8 days from first to last. Mon 05Mar2018 10:25 - 1st egg laid between 05:55 and 10:25. 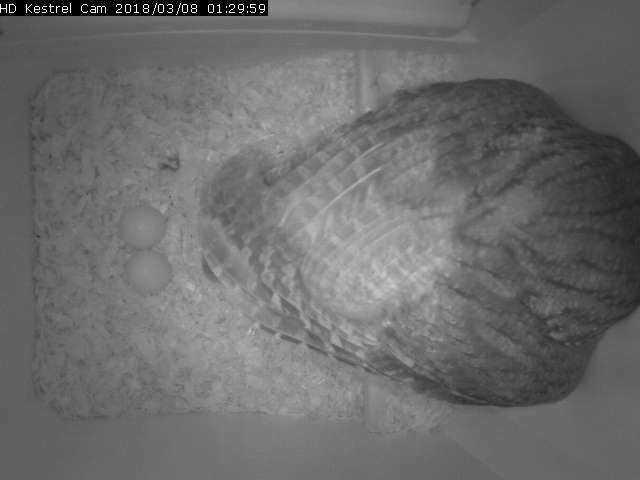 In the 1st snapshot below, 2 eggs are visible at 01:29 on March 8th. In the 2nd snapshot below, it is just after sunset and the female is getting ready to "be nocturnal" and leave the box. The 3 eggs are visible, as is the cached mouse which the male brought to the box 2 days before. She either left the box with the mouse or ate it just after midnight on the night of March 11-12. Fascinating to see another great species make use of our nest boxes, even though we are focused on the kestrels! Keep us updated. Love this. Thank you for posting! My neighbors' have 3 chicks that hatched out a couple of weeks ago. How about yours? Are you still monitoring their progress? Posted in General Discussion by Van Hoozer 1 year 1 month ago.